What’s the goal of every guest check-in? It’s more than delivering the guest a room, but for many years that’s how check-in has been treated – as a means to an end. But no matter how a guest checks in, via mobile or at the front desk, check-in should be so much more. It is the beginning of the on-property experience, and it can tell a guest so much about what her stay will be like. If she’s checking in via mobile, the experience can make or break her feeling of trust with the property based on the seamlessness or friction of the mobile experience. 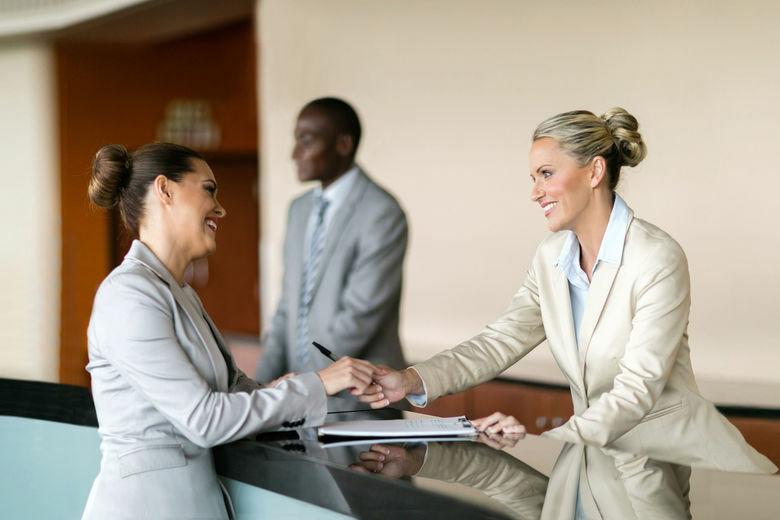 Should a guest check-in via the front desk, every aspect of that interaction has meaning. Is the agent kind and welcoming? Doing a job or creating a relationship? Does the agent offer more than the opportunity to take a credit card and return with a key card and a map? Sometimes hoteliers or, more often, their front-desk staff considers the act of upselling at check-in to be overstepping, pushy even. However, when done right, upselling at check-in actually better serves the guest and generates revenue. Take, for instance, a beautiful mid-century lodge in Colorado. The historic property was purchased recently, and the room quality is inconsistent as the renovation rolls out. A guest that reserves a standard room by phone may end up in a room that hasn’t been updated, albeit at a reasonable rate. However, a guest who has booked online has seen only the updated rooms on the hotel’s website. Sending this guest to an unrenovated room will be a poor guest experience from the beginning. Rather than have the guest come back complaining only to offer a free upgrade to a refurbished room, what if the front desk instead explained the situation at check-in and offered an upgrade to a renovated room at a minimal charge? Chances are most guests would pay for it. Of course, this is an atypical situation, but the point is that the guest will start with a better experience of the property and the property will generate more revenue on the stay. The same tenets apply to a property with all rooms lovingly tended and ready to go. The ability to improve the guest experience while increasing revenue at the point of check-in should never be underestimated. At the same time, today’s consumers are inundated with messages about offers to such a degree that it can be challenging to rise above the noise. Moreover, hotels don’t want to appear to be continually asking for more, more, more. Implementing a technology solution capable of harnessing the power of artificial intelligence (AI) that equips hotels staff with the ability to provide the right offers to the right guest at the right times solves this complex problem. Studies show that using AI to generate more relevance for the consumer can reduce acquisition costs by as much as 50% while increasing revenue by 43%. By using intelligent pricing and merchandising engines, hotels can better serve guests at the point of check-in, offering better rooms at a price that the system knows, based on prior data, the guest is likely to pay—and this applies to both mobile and front-desk check-in. Further, a system that uses millions of historical booking records, then applies machine learning can deliver upselling opportunities, such as a business traveler package complete with breakfast and mini-bar access, at the point of check-in. Alternatively, spa treatments, golf, lunch, dinner, cocktails, and so forth, can all be based on the guest’s preferences. Our research shows that the average upgrade at check-in can bring in an additional $39 per night, and further, it keeps the guest on-property, enjoying everything the hotel has to offer, likely spending even more once they’ve taken a seat at the charming cocktail bar. Upselling to guests prior to arrival is effective, but we find guests are more open to upselling offers the closer they get to check-in. The guest’s business meetings are now confirmed, or they’ve bought their show tickets and made dinner reservations, and now they know exactly what they need to make their trip as useful or enjoyable as possible – a big desk to prepare the presentation, a separate room for the kids, or access to the executive lounge for meetings. That said, the wrong offer won’t drive revenue and may work against the goal of increasing guest satisfaction. It may come across as purely a sales pitch, and no guest appreciates that. Hoteliers who don’t leverage the technological and sophisticated solutions needed to improve their merchandising offers will struggle to generate revenue and guest satisfaction. To significantly increase the percentage of offers that are accepted by guests, hotel operators need advanced technological tools that can not only sort through guest data but can also use this information to produce offers that are finely-tuned to the reason for the guest’s travel. Reports indicate that the application of an intelligent upselling solution averages $2+ incremental RevPAR for business hotels and $4-6 for resort/destination properties, with the majority of this additional revenue going straight to the bottom line. Today’s advanced check-in solutions feature real-time performance metrics that will motivate and empower every member of a hotel’s team. With a simple interface operating in real-time, front desk staff can be sure that they’re offering the right upsell to the right person. And since the technology is creating the recommendations, hotel staff can focus on other tasks, saving significant human resources, which can be redirected to serving guests and improving the guest experience in additional ways. But how do we encourage the front-desk to upsell if we’re not watching constantly? We get this question a lot. “They just don’t do it if a manager isn’t there supervising.” The benefit of an AI technology is that it also generates incentives based entirely on the value of the upsell. Additionally, using gamification technology, the system encourages individual performance as well as team performance, providing transparency to each team member about how well they are performing as individuals, and as a team. The result is a culture where everyone is working toward the same goal of increasing guest satisfaction while also improving RevPAR. Using AI-powered data and intelligence at check- in is necessarily about more than upselling. As Skift notes in The Evolution of the Hotel Front Desk, “Treating a traveler as nothing more than a walking, talking, grab bag of preferences, attributes, and emotional buttons to be exploited for upselling will backfire on hoteliers.” Further, “The travel industry also needs to rethink its chase of digital tools and services as a proxy to the human experience, and build real social experiences as part of the social spaces it incorporates.” Technology plays a supporting role to the social experience at the front desk. Delivering AI-powered recommendations to front-desk agents not only allows them to offer the guest an opportunity for an elevated experience, it also enhances their ability to connect socially with the guest through efficiency (i.e., having done the legwork for the agent, thereby freeing them to engage) and understanding (i.e., creating a relationship with guest throughout the in-person process). Better serving guests, which should be every hotelier’s primary goal, involves a marriage of social experiences and technology to determine what will make the guest’s stay better. Fortunately, when done well it always results in more revenue. Hotels will pull ahead of their competition—and create loyal, high-value guests—by employing intelligent technology to increase incremental revenue and offer a stellar experience. Nor1, Inc. is the leader in hospitality merchandising technology. Headquartered in Silicon Valley, with offices in Germany, Mexico and India, Nor1 provides data-driven pricing and merchandising solutions to maximize incremental revenues for hotels and resorts worldwide such as Hilton, IHG, Carlson Rezidor, Accor, and Wyndham. Nor1′s patented, dynamic decisions intelligence engine PRiME®, powers Nor1′s Merchandising Platform including its signature eStandby Upgrade®, eXpress UpgradeTM, CheckIn MerchandisingTM, and eReachTM products. Nor1 is creating the fusion between technology and guest experience. It”s that combination of expertise and skill that have set Nor1 apart and continues to attract technology”s most distinguished investors such as SAP, Goldman Sachs and Accel Partners. For more information, please visit www.nor1.com.